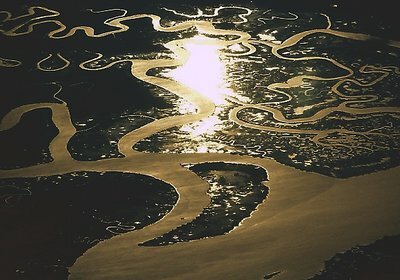 About From the air: a river, tributaries and branches, lit by the sun near dusk. Very unreal forms, an excellent image. I would have given it a bit less light, in order to the prevent the brightest spot from 'burning through'. But these are extremely difficult metering situations, and often one just has to choose between alternatives both too much on the wrong side (over/under). Good work.